Who don't want to sip a nice hot or warn cup of tea , I do what about you? 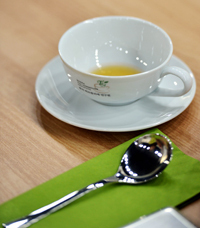 Different types of tea are displayed at the Korea Tea Sommelier Institute. And I have always been fascinated about this beautiful and aromatic Korean teas. Autumn is in the air. The sky extends higher while the days become shorter and the moon seems bigger. It's the time to welcome the season of harvesting and giving thanks with a cup of tea. With the cool, autumn winds, a cup of tea is exactly what our tired bodies and souls need. Try substituting drinking water with some warm barely tea or choose from a wide selection of gourmet green tea leaves. There is a whole batch of tea out there to last until winter. To properly brew and thoroughly enjoy the best cuppa as autumn approaches with rainy, chilly weather, a tea sommelier can help you choose the perfect one. A sommelier is generally regarded as a trained and knowledgeable wine professional but the term, in fact, refers to a “taster” of any kind of food or drink. 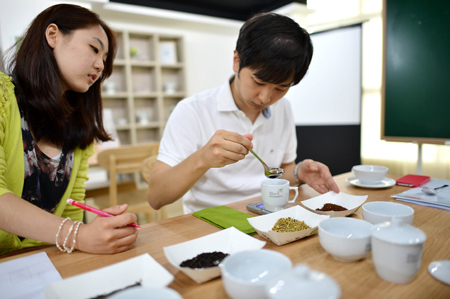 With the advent of sommeliers specializing in a wider range of things such as vegetables, rice and even kimchi, a tea sommelier has become a popular, up-and-coming profession. As an expert, a tea sommelier understands the alchemy of brewing a great cup of tea ― at the right temperature, with the right amount of tea leaves and accurate steeping times. It seems pretty common to think that a tea sommelier is responsible for nearly all things related, including storing, selling, pairing, and serving, you guessed it, tea. 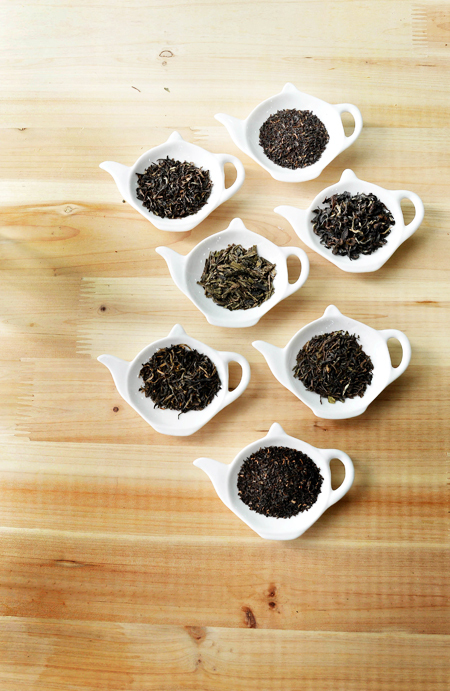 “Nearly everyone misunderstands the role of tea sommeliers,” said Lee Kyo-hyun, CEO of C21PR, a Seoul-based PR agency. “They are not responsible in the distribution process at all. They only focus on understanding, tasting, and recommending the best tea to their customers. Of course a deep knowledge of all kinds of tea is essential,” said Lee. Unlike in Western countries like the United Kingdom where tea is part of the daily routine with an afternoon tea-time, the industry and the job may seem unfamiliar to the majority of people in Korea unless you live in a temple or work in Insa-dong. In areas like Hongdae and Daehangno, small cafes specializing in tea have sprouted in the past year. Large teahouses like Ogada prove its growing popularity too. Well do you know what Ogada means? Ogada is a take-away cafe that specializes in traditional tea available in five varieties and now has over 50 franchise stores nationwide. 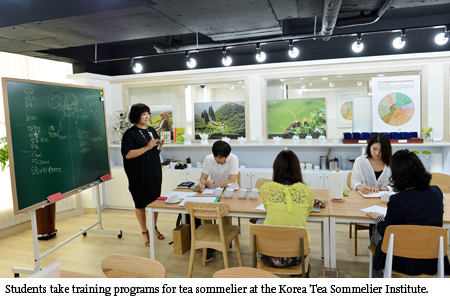 For those wanting to learn more about tea, there are various training programs offered by the Korea Tea Sommelier Institute. Established in October last year, the organization, located in Sinsa-dong offers three different courses depending on the pupil’s level and knowledge. 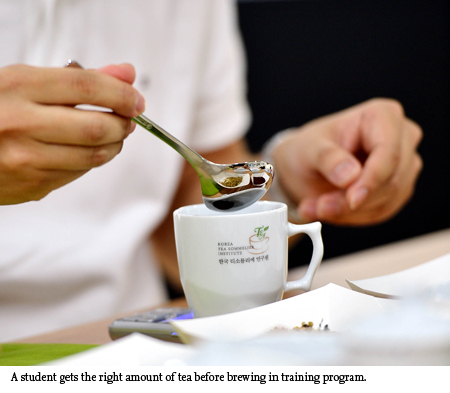 The classes at the institute mainly focus on developing practical skills such as cupping and tasting. It also plans to include on-site training to assorted countries where tea is grown such as Sri Lanka, India and Taiwan in the near future. During the trip, participants are expected to learn about tea from A to Z including tea cultivation, harvesting and distribution. “I started taking lessons six months ago just as a hobby and now it has become my dream career,” said Lee Bo-ra, who currently works at Caffe Bene, one of the biggest coffeehouse chains in Korea. The 25-year-old said that the more she learns, the more she finds it interesting and fun. Like Lee, the other students come from similar backgrounds or with the same intentions. “Registered students so far are from business backgrounds like hoteliers or those planning on starting their own tea business,” said Lee Kyo-hyun. A 31-year-old interior consultant, Im Jae-kyung, seemed very passionate about the profession and takes it very seriously. He shared his opinion on the current status of the industry in Korea thanks to his brother who has been in the tea business for many years. As the consultant pointed out, the proliferating number of coffee shops in the country says something about the business environment; the local market is already saturated. “There is a certain limit as to how much you can do with coffee but not with tea,” said Kim Won-jeon, director at the institute. Kim studied and specialized in tea in Canada and the U.S. for over three years. “I personally think being a tea sommelier is a job that creates value as time passes. And plus, isn’t it such a healthy job?” Kim said. The expert also emphasized the importance of its role in today’s fast-paced, Internet-oriented society. “These days, we mainly communicate online rather than offline. Interpersonal relationships become weaker due to a lack of face-to-face contact. In this situation, tea acts as a ‘bridge’ to connect people,” the director added. Asked what teas do Koreans love the most and will really suit the cooler temperatures of autumn, she answered, “Korean people used to drink green tea a lot in the past but now we see people looking for more unique teas like puer tea and black tea,” said Kim. She also suggested Chai will help warm the body as there are many different recipes or preparation methods. Chai or cha is merely the generic word for “tea” in European and Asian countries. Many places have their own version of the tea.